Under what conditions does your best learning occur? Many folks, myself included, say their best learning happens when they create something previously non-existent. Where are the places in your school where learning happens, not through instruction and a prescribed curriculum, but through inquiry and exploration? Where is the central hub of your school learning community? A maker space may be just the thing for breathing relevancy and energy into your school library, or media center. According to Nick Provenzano, aka "The Nerdy Teacher," these are the four essential reasons why a media center makerspace makes sense; space, furniture, supervision, and access. School media centers provide open, flexible space. Collaboration, interaction, and hands-on engagement need space for versatility and movement. Visible, transparent learning will ignite curiosity and interest from teachers and students. Tables and chairs that offer flexibility and comfort send signals that the media center is an inviting space for freedom, creativity, and innovation. To create unique areas, look for furniture that slides or rolls. Oversized pillows and carpet squares provide spaces for students to sit comfortably while making. Writable surfaces and Lego walls provide opportunities for visible, design thinking. The library staff provides watchful eyes to help students feel safe and supported. Much like the shifting role of the classroom teacher, library personnel should be asking driving questions instead of providing answers. Making is a personal, participatory adventure that doesn't require regimented guidance. Extended hours and almost limitless availability mean more time for creativity and innovation. It strikes a special chord when students become so engrossed in their making that they lose track of time and don't want to leave. An inviting, engaging makerspace will significantly alter the media center climate. Ultimately, the library makerspace will impact a school-wide learning culture. Makerspaces provide the conditions for some of our best learning. For many schools, the library provides the best fit for accessible, participatory learning. 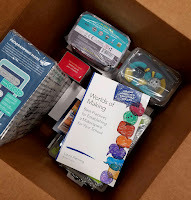 I've shared four important reasons for hosting a makerspace in your school library. Of course, there are more. I invite you to turn this post into a discussion by sharing your thoughts on media center maker spaces in the comments section. Fleming, Laura. Worlds of Making: Best Practices for Establishing a Makerspace for Your School. Thousand Oaks, CA: Corwin, a SAGE, 2015. Provenzano, Nicholas. Your Starter Guide to Makerspaces. United States: Blend Education, 2016. "Why Personalized Learning Should Start in School Libraries." ESchool News. 02 Feb. 2017. Web. 22 Feb. 2017. This is true that school media centers provide open, flexible space. Collaboration, interaction, and hands-on engagement need space for versatility and movement. So students should be engaged in different activities to learn better.